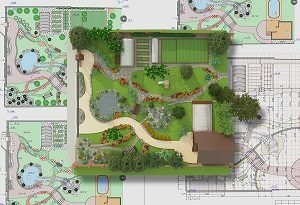 Some people are intimidated by the start-to-finish process of landscaping, while others are surprised on the numerous steps a landscape design-build process can have when working with a professional team. Here at Greener Horizon, we’re looking to help de-mystify the process for everyone, as well as provide a roadmap for customers on what they should expect. The order and steps of this process may change from landscaping firm to landscaping firm, but should cover all the same bases and be roughly in the same order. The first part of the process happens after you’ve reached out to a landscape architect. As part of a consultation process, the design team will go over your needs as well as survey your landscape. Expect to be asked a lot of questions here, from your needs to your wants, to suggestions on different options and designs. Next, the landscaper will take measurements and start designing. This design or designs will help set the scope of the project, from physical limitations to material options. Designs will have an estimate of costs based on the materials, construction, and time required. At this phase, you’ll go through more questions and pick a design you like. After settling on an initial design and budget, the contractor will work out the full blueprint. Final designs, materials, and budget parameters will be locked in, as well as any additional measurements that need to be taken at the site, such as soil samples. After the plan is finalized: congratulations! You now have a landscape design. If you’re working with a design-build firm, they can also build it for you. This requires entering into a contract if you hadn’t already, and then scheduling the start and completion dates for the project. Next comes the installation phase when construction occurs. Before any ground breaks, the necessary permits or approval, such as with digging or installing gas lines, will be collected. Depending on the scope and complexity of a project, it might take a few days or a few weeks to finish. Additional factors such as weather can cause delays, but your contractors will keep you in the loop. Once the project is done, there will be a final walkthrough of the project to make sure you’re satisfied with the work. At this time you’ll be given information on maintaining the new landscaping, including instructions on how to operate and care for newly installed features and plants. At this time, a follow-up meeting may be scheduled to check back in at a later date. Greener Horizon is a full-service design and build landscaping company, with project leads and contractors who will stay with you through the entire landscape design-build process. Learn more about our Landscape Design/Build process, as well as commercial and estate landscape management to both build and maintain your landscape. Contact us today, or sign up right now for a complimentary consultation.